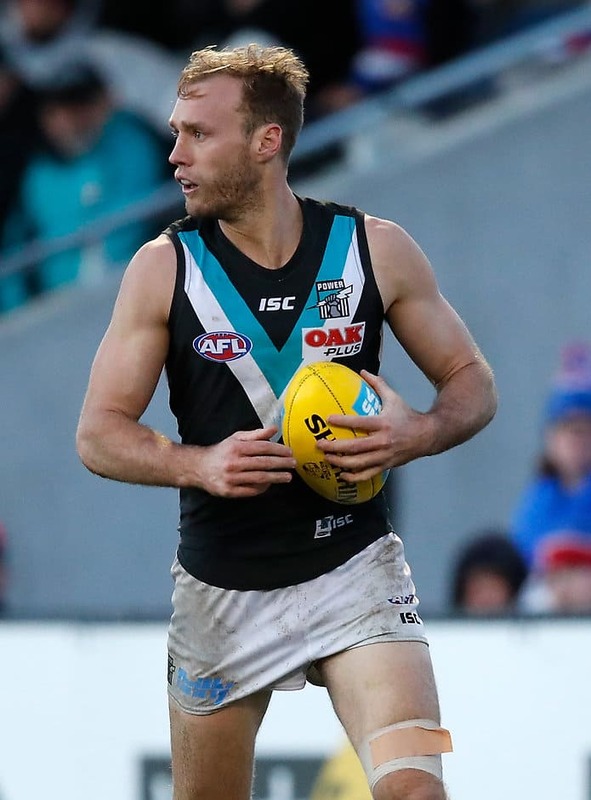 GOLD Coast has moved to reinforce its defensive stocks after losing Steven May by bringing in Jack Hombsch from Port Adelaide. The Suns gave up a fourth-round pick in next year's NAB AFL Draft, which is linked to Adelaide, to Port Adelaide, in exchange for the backman. Gold Coast sent former co-captain May, along with Kade Kolodjashnij, to Melbourne, in exchange for selection No.6 in this year's NAB AFL Draft. Hombsch, 25, has played 98 games in his career. In 2014-15, he lined up in a combined 46 matches but has otherwise not been able to maintain a spot in the Power's senior line-up throughout his career. Hombsch finished third in Port's best and fairest in 2015. He was originally on Greater Western Sydney's list as a 17-year-old access selection. Hombsch spent one season at the Giants before being traded at the end of 2012 for pick No.28 in that year's NAB AFL Draft. Hip problems have dogged Hombsch throughout his career, seeing him require surgery on multiple occasions. Gold Coast list manager Craig Cameron said he wanted to recruit older players lacking opportunity at their current side. "Jack will bring a strong and professional work ethic to the club, but also provides us with versatility in defence, having the ability to play on tall, medium or small forwards," Cameron told goldcoastfc.com.au. "We've had a clear strategy to target mature-age players who're looking for greater opportunity at AFL level and are of great character. Jack definitely aligns with that plan." Power football manager Chris Davies also lauded Hombsch's character. "Jack is a quality person who has been great for the culture of Port Adelaide," Davies told portadelaidefc.com.au. "It's a difficult part of the AFL industry that sometimes you have to say goodbye to good people. "Jack is a solid and experienced defender, but we have a few key position options who are in front of him at the moment, which has limited his opportunities. "We understand his want to play regularly at AFL level and we wish him all the best with the Suns."